A few days ago I found a flyer under my door announcing the Grand Opening of a new Chinese restaurant around the corner, which evidently replaced the take-out pizza place that used to be there. For the most part the menu is like that of all the other take-out Chinese places in the area, but when I went over the appetizers I encountered some unfamiliar dishes. I had never before encountered 芝士士的. I suppose this doesn't make a lot of sense if you can't read Chinese, but it doesn't make much sense if you can read Chinese either. The first character means "a kind of magic fungus". The second and third mean "scholar, gentleman". And the fourth means "clear" or "a little". The trick is that this is a purely phonological spelling. If you read it in Cantonese, it comes out: [ʧisisitik]. cheese steak is the Philadelphia speciality. This was already heartening. The people who wrote the menu must be Cantonese speakers, or at least speakers of something other than Mandarin. The final /k/ is a give-away. Mandarin has lost final /p/,/t/, and /k/. We linguists are supposed to love all languages equally just as parents are not supposed to favor one child over another, but we have human feelings too. I grew up believing that Cantonese is proper Chinese, and I still do. Mandarin is the language of school teachers and government officials. It is useful to learn, but you wouldn't use it with your friends. Cantonese is the language of intimacy and real life. It used to be that the great majority of Chinese speakers in North America spoke Cantonese, but there has been a great influx of Mandarin speakers in recent years. Why, last year I went into another takeout place nearby and was dismayed to realize that the two cute young women behind the counter were speaking Mandarin. So its nice to know that the new restaurant is holding up the side. But it gets better. It isn't unknown for Chinese restaurants to serve some non-Chinese food, but this place has gone one step further. 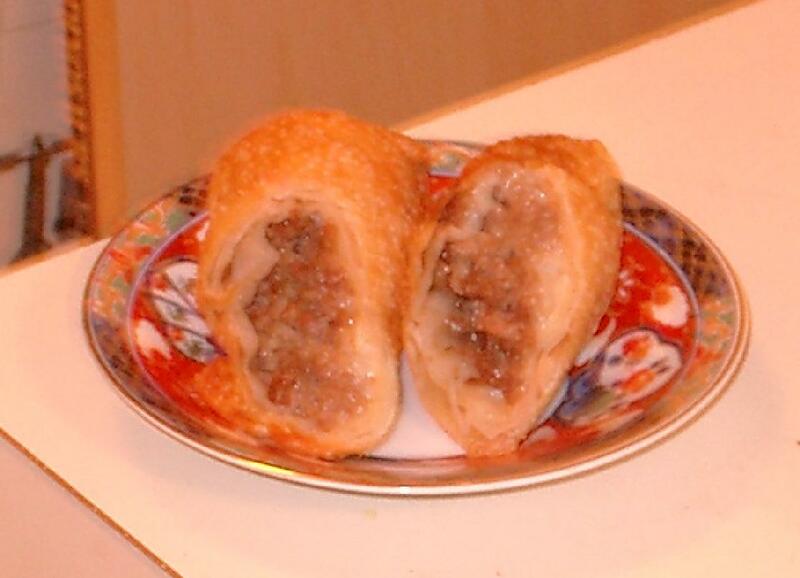 Not only can you get cheese steak, you can get 芝士士的巻 "cheese steak roll"! As a linguist and connoisseur of Chinese food it was clearly my duty to check this out, so I ordered a couple. I can't say that it seemed terribly Chinese, but I have to admit, its good, and it goes nicely with my favorite (闌記 brand) chili and garlic sauce. It consisted of a miniature cheese steak inside a spring roll casing, and amazingly, the casing was fried to perfection, neither soggy nor brittle and dried out. I rarely order spring rolls because very few restaurants cook them properly. I had to sacrifice the first one to my investigation, so here's a photo of the other one. I have to warn you that these things probably contain enough cholesterol to kill a horse. The mention of such things here on Language Log is not meant to endorse their consumption by amateurs. Remember, we're trained professionals.